Irondequoit Bay side of the Bayside Pub. Lawmakers gathered Thursday in a flooded area of a Webster tavern to announce legislation that would expedite emergency funding for counties and towns dealing with water infrastructure issues. 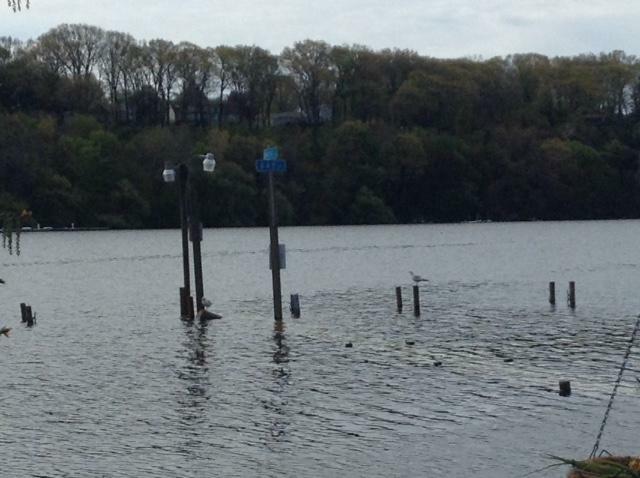 The entertainment area and rear docks of the Bayside Pub on Irondequoit Bay are submerged. State officials used that as a backdrop to announce that legislation which would provide emergency assistance immediately for municipalities has passed the Senate and is now in the Assembly. State Senator Pam Helming co-sponsored the bill. "Under the current budget language, this emergency funding is not available for 120 days after the governor signs the budget. That would take us to August 18th. The legislation that I sponsored in the Senate and Leader Morelle is carrying in the Assembly, will remove this waiting period," she said. State Senator Pam Helming, et al. Morelle says homeowners will benefit from any emergency water infrastructure funding the bill provides to their municipalities. "Issues related to their clean water pumping stations, wastewater facilities. So this is for municipalities. Obviously the benefit for homeowners as it effects municipal water systems, it's going to help all the homeowners in the region as well," he said. Both Helming and Morelle say they haven't talked with the governor about this bill, but they don't anticipate any problems with this bill moving forward. "This money, this emergency money, is specifically related to infrastructure, so water and waste water infrastructure." Helming added.